Thailand, And The Wonders of Asia. Thailand is a perfect holiday destination whether you want to explore the country’s rich cultural heritage or just enjoy stunning beaches and night parties. The country is famous especially from tasty and cheap street food, natural wonders, exotic spices, fabulous luxury hotels and ever-smiling locals. Among the popular tourist attractions are Kabi province with amazing beaches, the Grand Palace in Bangkok, pink lakes (lakes with pink water lilies in bloom), magical botanical garden Suan Nong Nooch in Pattaya, ancient capital of Thailand called Sukhothai, historic City of Ayutthaya and a temple in Chiang Mai city. Tourists have the opportunity to see exotic Gibbons in the Khao Sok National Park, whale sharks, elephants and monkeys. Besides sightseeing, many tourists enrol to cooking and boxing classes or get Thai massages and exceptional spa treatments. 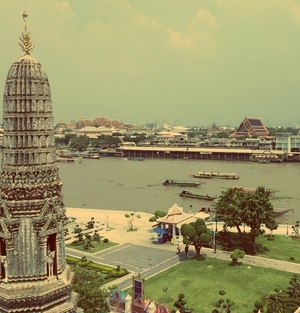 Thailand is also a perfect gateway to see other Asian countries. The best time to go to Thailand is from December to March. You can visit Thailand in other months too but avoid the monsoon season (July – October). Tourists from the US, UK, and holding EU passports are given a free 30-day visa when entering Thailand by air and 15 days if entering overland. This visa can be easily extended when needed.